1. Why was there an increase in my taxes? 2. How will the money be spent? 3. Why should I have to pay? I live out in the country and have no drainage problems. 4. Doesn't the County already have funding in place for storm water issues? 5. 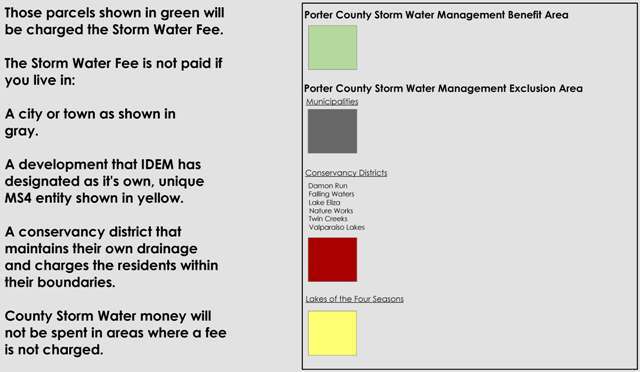 Do residents of Valparaiso, Portage or other Cities & Towns within Porter County have to pay the county storm water fee? 6. 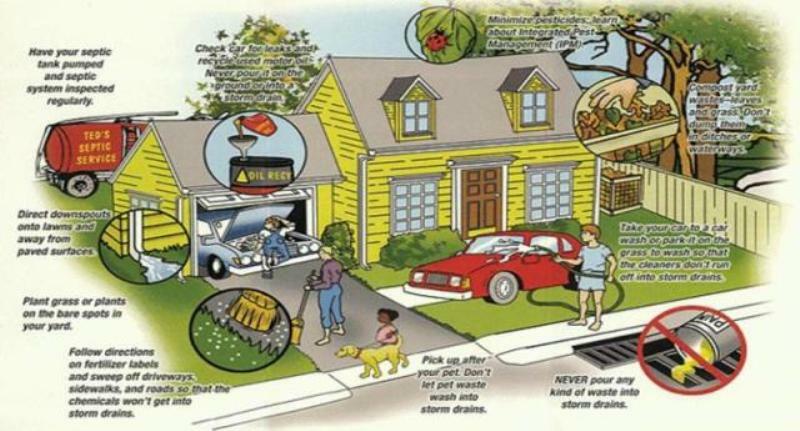 What is Storm Water and why is Storm Water Management so important? 7. What is storm water runoff? 8. What problems can runoff cause? 9. Who oversees Storm Water Operations? 10. Are sanitary sewers and storm drains the same thing? 11. What is the clean water program? Action was taken in order to comply with federal mandate from the Environmental Protection Agency (EPA) and the Indiana Department of Environmental Management (IDEM). IDEM designated Porter County as an MS4 entity which requires the county to comply with standards for clean water. You may not have any drainage problems, but the runoff from your property can contribute to the downstream flooding and water quality problems. A responsible approach recognizes that everyone contributes to runoff and that everyone shares in the results (better road drainage, cleaner water and reduced flooding). For example: there are about four pipes that cross under each mile of county road, and these need to be cleaned and sometimes replaced. Historically, money from the Highway Department has provided limited funding for storm water operations. However, these funds can be used only within road rights of way and are needed not only for drainage but for road maintenance such as resurfacing, pothole repair and snow and ice management. While residents of incorporated areas do not pay the County storm water fee, Valparaiso, Portage & Chesterton do have their own fee. Storm water is rain, snow, sleet or ice melt flowing over land with all debris and pollutants picked up along the way. This water flows into a system of pipes, ponds and ditches that empty directly into our creeks, lakes and rivers. These systems require maintenance to prevent pollution and improve water quality. Storm water is not treated at a treatment plant so it is up to individuals to make sure the water depositing into the environment is clean. Storm water runoff is water from rain or melting snow that runs off into receiving streams and lakes instead of seeping into the ground or evaporating. This runoff is not normally treated in any way before it enters lakes and streams. It does not go to a wastewater treatment plant. For water supply, communities must pay more to clean polluted water than clean water, and the treated water is not as pure as that coming from a clean water source. Treatment may not completely remove taste and odor problems if the source water is not clean. Property owners do not like muddy water or water containing trash or that has an odor draining onto their property. Polluted water also hurts the wildlife in creeks and lakes. Dirt from erosion covers fish habitats and fertilizer in runoff causes too much algae to grow. Soap in runoff hurts fish gills and skin. Storm water operations are overseen by the Storm Water Management Board and the Storm Water Advisory Board. No. Storm drains collect and carry runoff from rainfall. Storm drains do not remove pollutants from runoff before it is discharged into receiving streams. Storm inlets are typically found in parking lots and near street curbs. Sanitary sewers collect wastewater from indoor plumbing, such as toilets, sinks, washing machines, and some floor drains, and take it to a wastewater treatment plant. 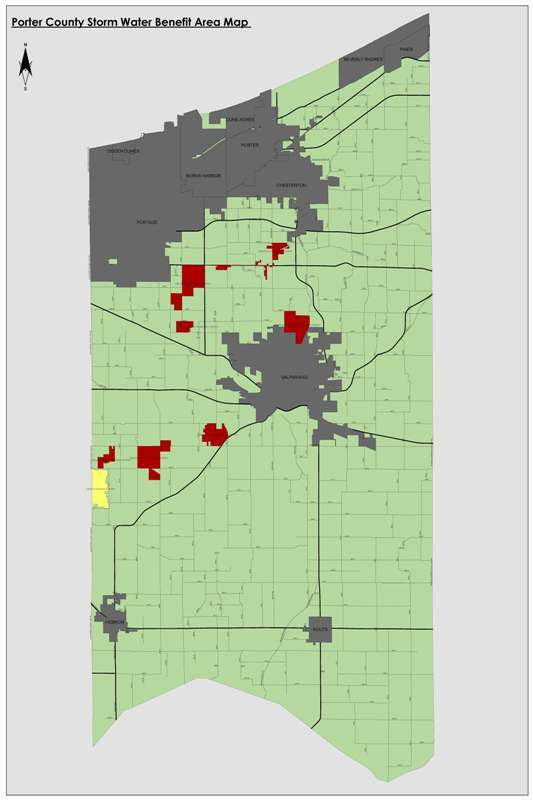 Unincorporated Porter County is regulated under the Clean Water Act (CWA). That means we are required to have a program that addresses public awareness, public participation, illicit discharge detection and elimination, sediment and erosion control practices for construction sites, long term clean water practices such as ponds and rain gardens, and setting a good example with county projects. Only RAIN in the DRAIN!!! Select native plants that require less water, fertilizer and pesticide. Mulch flower beds to reduce weeds and conserve water. Plant pest-resistant species or species that attract beneficial insects. Compost lawn wastes instead of washing clippings or leaves down the storm drain (Where do I take compost?). Avoid putting lawn waste near ditches or creeks. Install practices such as rain gardens that filter runoff and promote infiltration. Permeable pavers can be used on top of open-graded stone to create driveways and sidewalks that allow rain to soak into the ground. Allow downspout water an opportunity to soak into the ground (at least a few feet away from foundation) instead of connecting it directly to a storm drain or street gutter. Always follow the label for disposal (Solid Waste Management). Use kitty litter; saw dust, or wood chips to soak up fluid spills. Be sure to sweep up and dispose properly. Do not “top off” when fueling your car, truck, motorcycle or any other motorized vehicle. Follow Label Directions. Use and dispose hazardous household material properly. Unused household chemicals should be taken to Solid Waste Management for proper disposal. Have your septic tank inspected every 3-5 years. Compost your food scraps, rather than use the garbage disposal. Click here for composting tips. Don’t pour household chemicals down the drain. This could disrupt the septic system’s treatment process and contaminate groundwater.